Granulated sugar 4 table spoons. 1/2 cup sweetened condensed milk. In a medium bowl mix flour, baking powder and salt. Sift and Set aside. Whisk egg whites until frothy. Then, slowly add sugar while whisking at high speed until it thickens, approximately 3-4 minutes. Add egg yolks one at a time while mixer is still running and mix at high speed for another 3-5 minutes until they’re blended thoroughly. Add half of the flour mixture and keep mixing until it is well blended. Then, add the milk and the vanilla extract. Finally, add the remaining flour. Keep mixing for about 2-3 more minutes until everything is well blended. Grease and flour a 9 x 2 inch (23 x 5 cm) round baking pan and pour in the batter. Tap a few times so the air bubbles rise to the top and bake for about 30-35 or until a knife inserted in the center comes out clean. Let the baked cake cool on a cooling rack. Time to prepare the frosting. Put whipping cream in a mixing bowl that has been in the freezer for at lease 15 minutes. Mix at high speed until it foam forms. Then add the powdered sugar and the vanilla extract, keep mixing at high speed until hard peaks form (about 3-5 minutes). Refrigerate till the time of frosting. 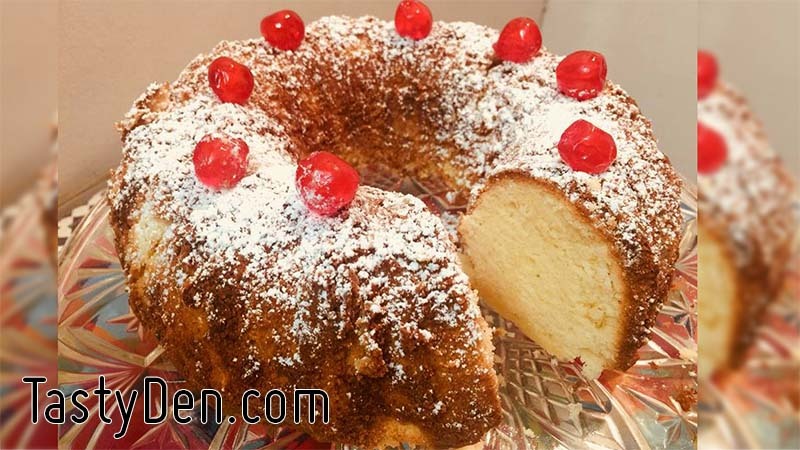 In a small container mix the milk, evaporated milk and sweetened condensed milk. Mix well and set aside. Once the cake has cooled, cut it in half with a cake leveler or knife to end up with two pieces. 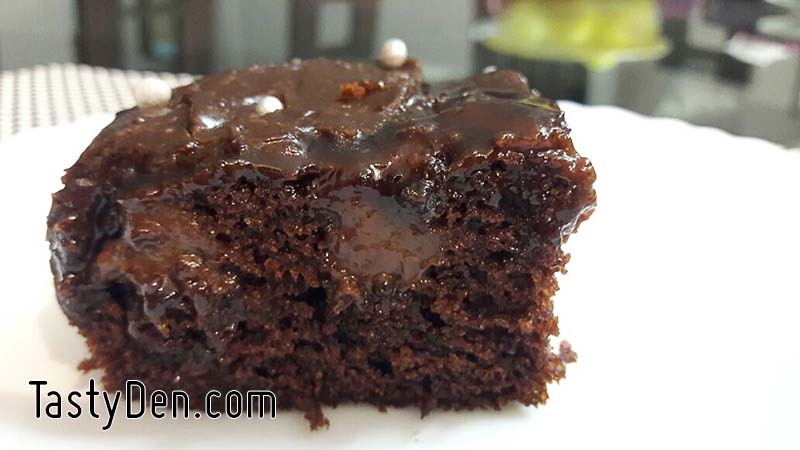 Poke one of the cake pieces with a fork and then pour half of the milk mixture, let the cake absorb it thoroughly. 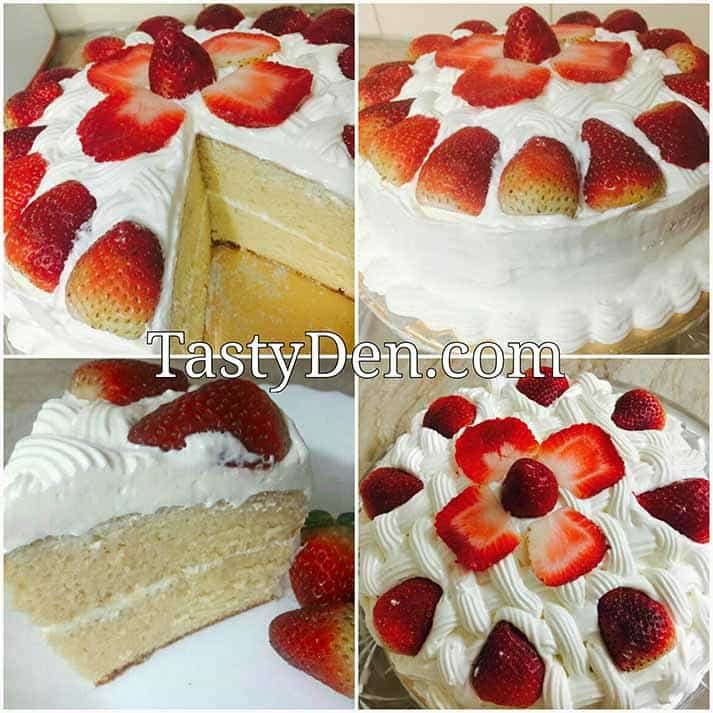 Once the milk has been absorbed, cover the cake with some of the whipped cream and then place the strawberry slices on top. Then cover the strawberries with another layer of whipped cream. Put the second cake piece on top of the strawberries, poke it with a fork and pour the rest of the milk mixture, let the cake absorb it. With the help of a spatula cover the top and sides of the cake with the whipped cream. 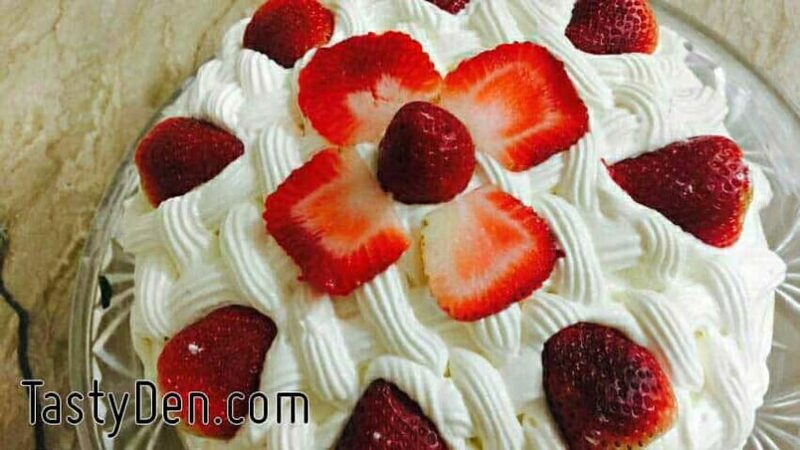 Put the remaining whipped cream inside a large pastry bag with the tip of your choice to decorate the top of the cake, as well as the lower edge. Finally put the strawberry halves on top of the cake. 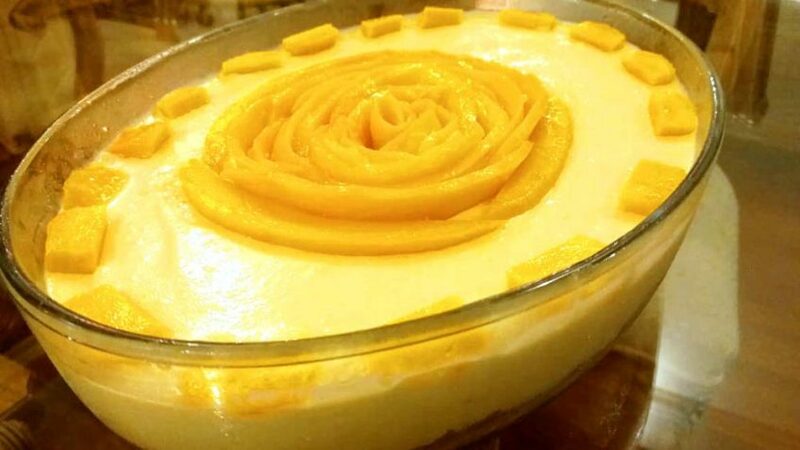 Refrigerate for atleast an hour before serving. To get the best result keep it in fridge over night. The more you soak your sponge in tress leches syrup the more your cake will get moist. My cake was melting in mouth because I kept pouring the tress leches syrup on the sponge till it left taking more. In fact it is the most important part of this cake. If you think that your tres leches syrup is finished and the sponge is still absorbing it then you can even make a little more syrup. You can add more or less strawberries according to your choice. You can use anyother fruit of your choice too but its mostly made with the strawberries. If you don’t want to add fruits you can sprinkle coco powder on the top or serve only with the cream frosting. That all depends on your choice. I kept it in fridge over night so the flavors get completely infused in the cake and “yes” the result was awesome.